NEW YORK (CNNMoney) -- The publishing tide is shifting fast: E-book sales in February topped all other formats, including paperbacks and hardcovers, according to an industry report released this week. E-book sales totaled $90.3 million in February, up 202% compared to the same month a year earlier, according to a study from the Association of American Publishers. That put e-books at No. 1 "among all categories of trade publishing" that month -- the first time e-books have beaten out traditional publishing formats. But an AAP representative noted that the report comes with some big caveats. First, the net sales data are compiled from publishers, not from book retailers like Barnes & Noble. Publishers submit that data voluntarily, and some choose not to do so. "It's not 100%, top to bottom, every single book out there," said AAP spokeswoman Andi Sporkin. "But it's a really good snapshot of what's going on." The AAP report attributed February's strong numbers to a post-holiday e-book buying surge by consumers who received e-readers devices as gifts. Back in January, Amazon (AMZN, Fortune 500) reported that its own e-book sales topped paperbacks. 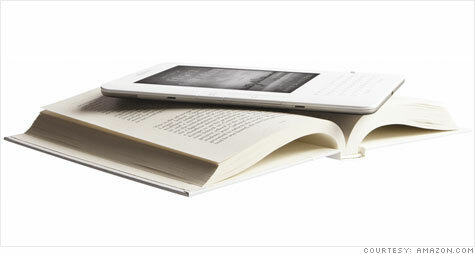 Its Kindle largely paved the way for the dedicated e-reader market. Beyond the Kindle, other e-readers include the Barnes & Noble (BKS, Fortune 500) Nook, the Sony (SNE) Reader, and Borders' Kobo. Apple's iPad is also driving digital book sales. Those devices are changing the way booksellers view the industry. Earlier this month, Barnes & Noble executive Marc Parrish forecast that traditional book retailers have just two years to adapt to an e-book-centric industry. "The book business is changing more radically now, and quicker, than movies or music or newspapers have, because we're doing it in a matter of months," Parrish said at GigaOm's Structure Big Data conference in New York. "[The] next 24 months is when this business will totally shift."